My trip earlier this month (March 4-10) was an adventure in planning for me. I had until this trip never planned anything Disney with the express purpose of going it alone. Now that is not to say I was alone when I got there because I met all the little faces I see on twitter and message boards and some podcast hosts. I would like to say going alone was a resounding success. It was extremely cathartic to come and go as I pleased, do whatever I wanted and not have to do anything more if I didn’t want to do so. You know what I found out, no, oh I need to tell you then. I found out I like to walk and wonder about the time, planning, detail, logistics and final execution of such a plan (WDW) that was so close to not happening, is able to be pulled off and that it continually brings in the crowds. My trip started directly following work and I drove off into the night to my off-property hotel (previously covered, click here to read that story) to get a little rest before the inner mouse meet at Disney’s Animal Kingdom. At 11 Saturday morning walking up to Flame Tree BBQ I saw JL and met Scott and John from Inner Mouse. I met maybe 40 people that day. It was quite a lot of fun to watch Moxie shots and talk to the box people who didn’t hear JL and called me ‘Rich’ in the chat room. No worries though, I was glad to take part. Then after lunch I met Lou Mongello and Steve Barrett. Both of these men are super generous with their time and wonderful and gracious to talk to. Lou gave me his Main Street audio guide and I will be writing a little review for it very soon. Later that night was the Annual Passholders' event for the 5th Anniversary of Expedition Everest: Journey to the Forbidden Mountain. I haven’t been part of an AP event since Mission Space opened. Much like back then I got to ride until I didn’t want to ride anymore. Then I rode it once more for good measure. Also open that night were Dinosaur and Triceratop Spin the evening was complete with a DJ. It was nice to see what we could of that park in the dark since it generally closes around sundown. Some of the gang chose to dance it up with the kids. There was lots of electric slide-ing going on. When closing time finally came, we walked out of the park, then the long walk out to the car to go home and sleep until it was time to start over. Sunday was check-in day at Saratoga Springs Resort. I had completed the online check–in 10 days prior to my arrival which was good since the check-in lines at 11 am were very long. My fault for going during Spring Break. Not to worry though, the online check-in went pretty fast and I actually got to have a choice of building I wanted to stay in. It was up to three locations though none of them were ready at that time. I chose over in the Paddock set of buildings since I have stayed over in that area before. However they neglected to tell me that the Paddock bus stop and lazy pool area with laundry was closed for renovation. It wasn’t a huge problem to overcome just, would have been good information to have when making decisions. No matter, I stayed in a Deluxe Studio so I wasn’t really hurting. On Monday I took my Keys to the Kingdom tour at Magic Kingdom. It is a 4:30-5 hour tour onstage and backstage and it points out many of the things the casual visitor may not know. We spent time on Main Street talking about the windows then around to Adventureland where I found out that the thatch roofing is *spoilier* aluminium. We saw backstage where Main Street Electrical is housed during the day as well as the floats for the 3 o'clock parade. After we all seemed thoroughly impressed, we stopped for lunch at Columbia Harbor House where I got the pleasure of sitting with our guide Claire, who was so nice and continued to tell me even more about the parks and how it all works. After lunch we got taken into the Haunted Mansion throught the VIP entrance (themed all the way with keys to the rooms and servants bells on the wall). Did you know that the frame the parlor has hundreds of little classic Mickeys around it? Well you do know and if you did already, have a sticker. Monday afternoon was nice because I went back to Epcot and took my time just snapping pictures of the topiary not knowing that at the end of the week they would be adding some new ones. 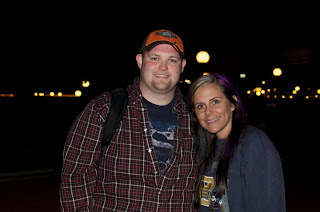 That evening I decided I wanted to go back to Magic Kingdom for Wishes and take my tripod. Also I was going to meet a twitter friend, Mary (her blog here) and her brother John, who had arrived earlier in the day. I met them outside the Crystal Palace where they found me disappointed because I had forgotten the quick release attachment for my camera making the tripod 5 pounds of useless metal. We watched Wishes and talked, then moved over to the hub to watch "The Magic, The Memories and You," the newest laser light show that projects pictures taken around the park that day onto the castle. If you missed my video of it, go here. After that show, we talked more and headed to I really want to say Pirates 1st, where we talked through the entire ride then rode a night time Jungle Cruise. Then we talked more and walked over and rode Big Thunder Mountain. We tried to talk through this too but the laughing and screamlaughing took precedence. We then talked all the way out of the park and then parted ways. John did snap us a photo since I think I did have the honour of being her first twitter friend to meet in person. Here we are, aren't we lovely? Like to know how my trip ends? Well kids, this is a two parter, tune in Saturday, same Mouse time, Same Mouse channel to hear the rest. Great post! Can't wait to hear more! sounds like a blast! I'm ready for "the rest of the story!"